Mark P. Buell - Buell & Elligett P.A. 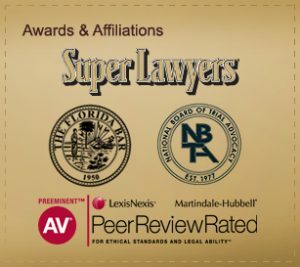 Mark P. Buell is a fellow of the prestigious American College of Trial Lawyers, a recognition achieved by less than two-tenths of one percent of Florida lawyers. He is Board Certified by The Florida Bar in two separate areas: Civil Trial Law and Business Litigation Law. He is also Board Certified by the National Board of Trial Advocacy as a Civil Trial Lawyer. He has tried many jury trials and has actual jury trial experience in a variety of cases in state and federal courts, including condemnation/eminent domain, personal injury, product liability, insurance coverage, title insurance and business fraud. He has been named to the prestigious list of Top 100 Lawyers in Florida. Mark attended the University of Florida on a football scholarship where he was a member of Sigma Alpha Epsilon social fraternity. He obtained his Bachelor of Science degree, with honors, in 1973 and his Juris Doctor degree from the University of Florida College of Law, in 1976. He practiced law at Shackleford, Farrior, Stallings & Evans, P.A., where he was a shareholder and member of the Board of Directors until 1990, when he joined Schropp, Buell & Elligett, P.A. as a shareholder. The firm became Buell & Elligett in 2007. Mark has been published on a variety of topics, including eminent domain, jury selection and liability for inadequate security. He has spoken at local and national seminars on eminent domain and trial-related topics. Mark has tried jury and non-jury trials in state and federal courts throughout the State of Florida including Tampa, St. Petersburg, Sarasota, Naples, Melbourne, Miami, Bartow, Jacksonville, Ocala, New Port Richey and Dade City, among others. On a personal note, Mark has been active in his local church and volunteers at the elementary school where one of his daughters teaches second grade. He is an avid college sports fan and enjoys traveling with his wife.